Spatial Analytics, Location Intelligence (LI), Mapping - Attain Insight Solutions Inc. The ability to visualize spatial data and understand relationships between specific locations, helps organizations make smarter and strategic business decisions. We refer to this as mapping and location intelligence, and by leveraging location-based data, companies can identify business growth opportunities and improve the sharing of information. Example above: Real Property Asset Management. Reporting the dissolution of property and material assets under management by the Canadian Coast Guard based on Depreciation, Expense and Facility Health Metrics. Similar solution used in other Real Property portfolios to analyse and optimize space utilization and cost optimization. Example Above: Fraud Analytics for CRA, analyzing commercial tax returns and proximity for optimal audit team on-site deployment. Similar solution available for Retail or Gaming Industry Analytics with access to thousands of demographic metrics on-demand as business data overlays. 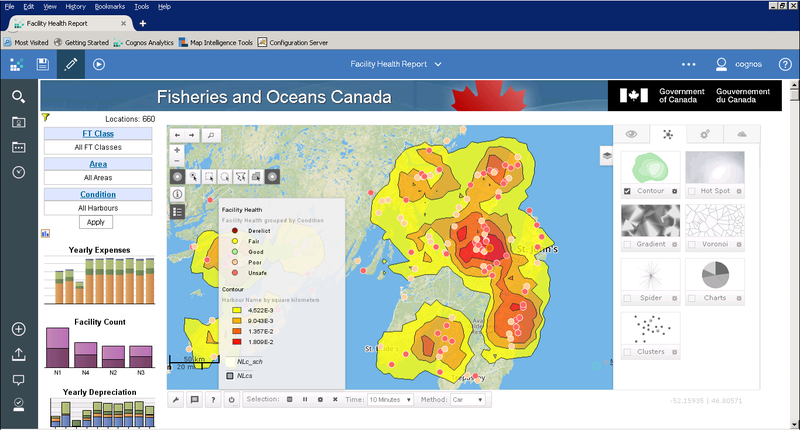 Spatial Analytics is for everyone from government officials, executives and business analysts - to front desk operations. Location enabled decision-making tools reveal so much more because complex data is often very poorly represented when expressed in charts or tables. For information, a demonstration, and pricing on a solution implementation contact us, we'd be happy to help!